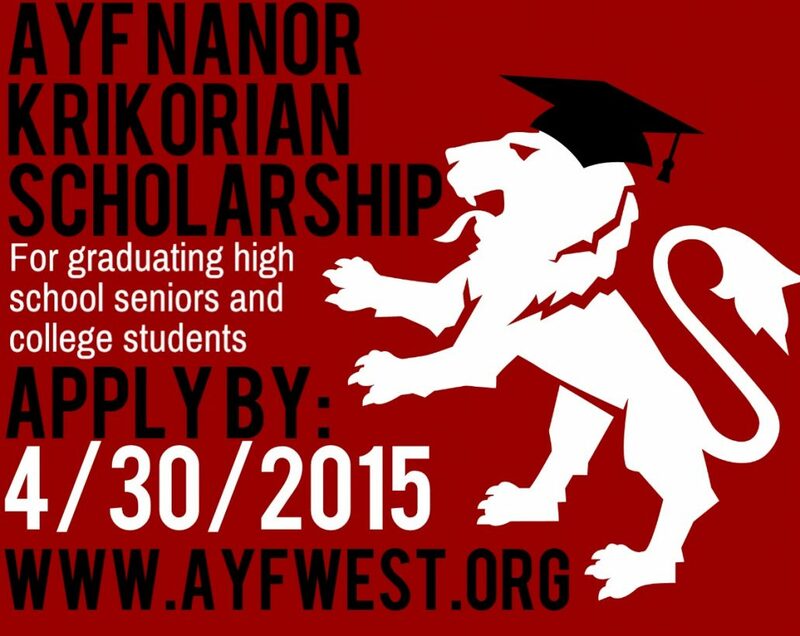 (GLENDALE, Calif., March 17, 2015) – The Armenian Youth Federation announced that the submission period for the “Nanor Krikorian” Scholarship has begun. The scholarship, which serves local high school and college student, is in its 12th year and has provided over $200,000 worth of scholarships over the last decade. “This is just another example of the investment the AYF makes not just in the youth or the community, but in our collective future as the Armenian Nation,” said Verginie Toulomian of the AYF’s Central Executive. This scholarship is awarded to graduating high school seniors and college students of Armenian descent to aid in furthering their education. Scholarship awards of $1,000, $500 and $250 are given annually to qualified students who go through the application process and show exemplary merit. Particular emphasis is placed on a student’s public service and extracurricular activities in the community. The “Nanor Krikorian” Scholarship was established in March of 2003 in memory of AYF member Nanor Krikorian, whose life was tragically cut short due to cancer. “Though Nanor is not with us today, her memory has been an inspiration to the youth in our respective communities,” Touloumian said. To apply for the scholarship, please download, complete and mail the application to the AYF Office at 104 N. Belmont St., Glendale, CA 91203, prior to April 30th. Applications may also be submitted through email by sending a scanned copy to ayf@ayfwest.org. The application is available for download on the AYF Website. Do you have any scholarships or grants for independent student who doesnt have income.